The small hamlet of Nissaki has managed to escape any large scale tourist development and, as such, enjoys an unhurried pace of life and a truly relaxed atmosphere. 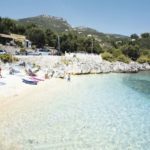 Nissaki Bay has three picturesque coves each sheltering its own pebble beach, clear blue waters and one with a tiny anchorage backed by a couple of fine tavernas. All the beaches have sun beds, parasols, pedalos and motorboats to hire and a selection of water sports to enjoy. Each beach has at least two waterside tavernas. Furthermore, on the main road there is a good selection of restaurants always with stunning sea views from their dining terraces and also a couple of good supermarkets and a bakery along with a few gift shops.